The recent McElhanney Consulting draft report used to justify a Broadway subway extension of the SkyTrain Millennium Line to UBC raises many questions regarding SNC-Lavalin involvement, assumptions, costs, ridership, mode shift and development. As a draft that has yet to be signed off by the engineers who wrote it, there are elements that look like it has been adjusted into a public relations document to favour a subway. This report is an update of the 2012 report prepared by SNC-Lavalin and Steer Davies Gleave. However, on Jan. 30, 2019, before the SNC-Lavalin corruption scandal broke in February, Vancouver council was rushed into endorsing SkyTrain technology for a subway extension to the University of B.C. based on the theory that with the federal budget fast approaching in an election year it was critical to move ahead immediately. Same with the TransLink Mayors’ Council. But now we know there is not likely new federal funding in the 2019 budget for the project, so the rush was unwarranted. SkyTrain is what TransLink calls the Vancouver regional rail system. It is made up of two types of technology: the Canada Line, which is conventional, and the Expo and Millennium Lines, which are unconventional. The unconventional Millennium Line technology would apply to the proposed extension to UBC, of which SNC-Lavalin (track and electrics) and Bombardier (cars) partnered to build the SkyTrain Millennium Line and continue to still produce and maintain the systems now in use. The current draft report makes assumptions that greatly limit the options, the largest of which is a subway from Vancouver Community College to Arbutus Street. This requires a handicap time penalty for transfer at Arbutus. The reported cost estimates are also questionable. They use the same 40- to 60-per-cent contingency for both subway and LRT, even though subway has way more risks with underground conditions, water and services that require diversion. For comparing the subway to surface light rail, rather than comparing actual costs of similar systems, the report refers to the cost estimates in the TransLink and Ministry of Transportation news releases. While most LRT projects are delivered for $50 million to $100 million per kilometre — like the recently approved LRT in Ottawa — the report uses $240 million to $282 million per kilometre, creating a further handicap against LRT. Although the bus system upgrades provide the greatest cost savings, the bus option costs are not provided at all as part of the comparison. The minor costs to electrify the bus system to eliminate diesel and reduce greenhouse gas emissions by expanding the trolley network to the B-Line or for expanded service would only be about $1 million per kilometre, plus $1 million for each additional articulated double trolley bus. Since the distance from VCC to UBC is about 13 kilometres, it would be a minimal cost to upgrade the whole length of the corridor to electric trolley with doubled lines for bypass of the B-Line plus new articulated double trolley buses. The current bus system throughout the corridor is far from maximized. Nor is it the busiest bus route in North America, as claimed. There are many more active areas such as in Ottawa and Mississauga, and many larger cities in the U.S. There is a list of bus optimizations in the report, but the option that has the most promise is only mentioned once, without a bullet. It is to add an express bus that goes from the subway terminus to UBC. If there was an electric express bus from VCC to UBC, it could take all UBC-bound ridership from the Millennium Line off of Broadway altogether, including the recent increase from the Evergreen Line. A new express route could further avoid congestion from VCC, along Second and Fourth avenues to Burrard Street and along 16th Avenue out to UBC. The existing No. 84 bus on Fourth Avenue could also be electrified with trolleys with double articulated buses to increase capacity like a proper B-Line rather than the current single buses. Also, the current headway could be reduced from peak hour of six minutes apart to three minutes like the No. 99 B-Line on Broadway. When comparing the current ridership between corridors, the report assumes incorrectly that all ridership going along corridors for Fourth, Broadway, 16th and 41st avenues would all be diverted to a Broadway subway. In fact, each corridor is also serving local needs, including even some bus routes on Broadway that have many more stops between the few on the subway or B-Line. This local service will be reduced or eliminated with a subway, like what happened on Cambie Street. However, would people who live close to 41st Avenue go all the way to Broadway to catch a subway rather than use a 41st Avenue B-Line? Assuming all this ridership would go to a Broadway subway is not accurate. The McElhanney report identifies that multiple lines of rapid transit had better mode shift from automobile to transit usage. They said that if two LRT lines were provided (such as the addition from UBC along 41st Avenue to Joyce Station) it would have better mode shift and peak hour capacity than one subway. But because the subway is assumed in all options from VCC to Arbutus, the longer double LRT line option was unfairly dismissed based on the artificially inflated cost estimates assumed for LRT plus the first phase of an assumed subway. But a continuous LRT from VCC to UBC that would cost substantially less, was not an option considered. Vancouver was designed before the common use of the automobile as a streetcar city. Everywhere is within a 10-minute walk of an arterial for transit. The original streetcar system was replaced with a trolley bus system that is still in use. For a minor investment, the trolley bus system could be expanded and upgraded to multiple routes, including multiple corridors to UBC with some LRT. This would be the most cost-effective way to broaden the most mode shift and serve the most people. It could be achieved for under $1 billion, while leaving most of the $7-billion subway funding to invest in affordable housing, including student housing at UBC. Transit should be about affordably transporting people rather than adding expensive SkyTrain infrastructure for delivering luxury condo development for foreign capital. We do not have to repeat the mistakes of the Cambie Corridor and Oakridge. Each neighbourhood can provide more housing choice and affordable options while maintaining character and scale through neighbourhood-based planning. 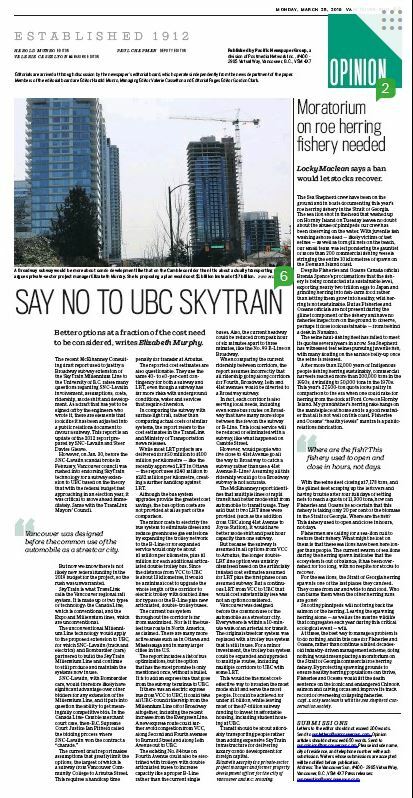 I hope many people read Elizabeth Murphy’s op-ed Monday about saying “no” to a SkyTrain to UBC. 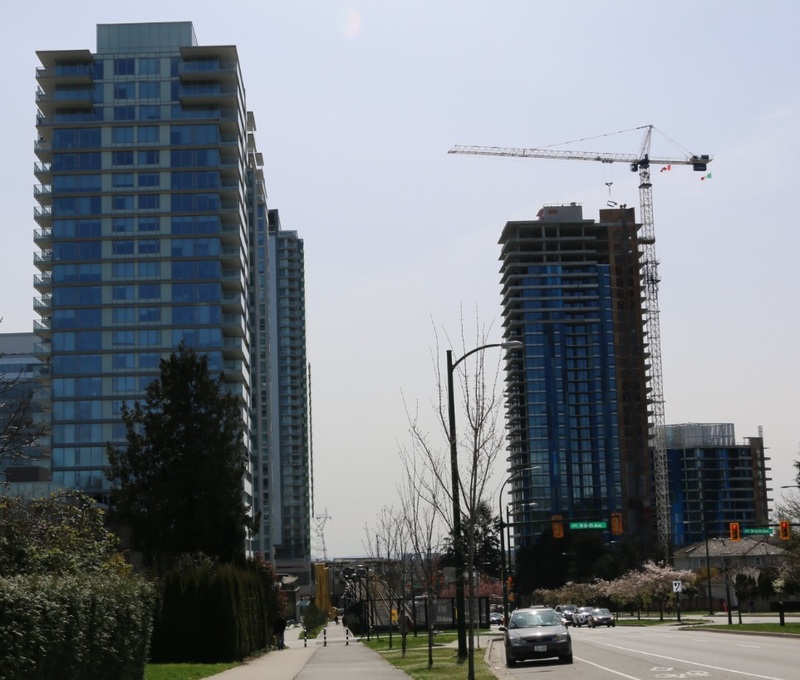 The drive to build highrise developments, as already experienced in other parts of the city, by pushing SkyTrain technology along the heavily used trafficways to UBC seems rushed and blinkered. The end should not justify the means. Murphy points out how little consideration has been seriously taken of other jurisdictions that have shown better and more cost-beneficial transit options, including light rail surface transit. Furthermore, I am not aware of full, meaningful input by the affected communities. I will never forget the Cambie merchant distress about how the Canada Line SkyTrain was done and how poorly they were treated and compensated, with little ability to voice their opinions. I worry how future generations will pay for the ongoing costs and debts incurred to cover the expensive build-out of the SkyTrain. This entry was posted in Elizabeth Murphy, Vancouver Sun and tagged Affordable Housing, Community Plans, Elizabeth Murphy, property taxes, Transit, Vancouver. Bookmark the permalink.